1) What does mindfulness mean to you – and how has it become a particular area of interest? Mindfulness is awareness of the present moment, to things as they are, alongside an attitude of kindness towards ourselves and others. Kindness here implies a gentle approach to learning and living, allowing the critical voice to dissolve and instead being discerning about how we treat ourselves and others. The way we treat ourselves has a direct effect on the way we treat others. Mindfulness started to become a particular interest to me when I was studying for my MA in psychological coaching. I had heard about it and began to come across the concept when reading and talking to other coaches. My moment of commitment was spontaneous. I was queuing to pay for books at Waterstones when I saw Mark Williams and Danny Penman’s book, ‘Mindfulness: A practical guide to finding peace in a frantic world’ on a stand in front of me; I bought it. The book is broken into eight weeks of learning through reading, short practices and exercises and it all grew from there. 2) What do you see as some of the benefits of practicing Mindfulness? I can speak from my own experience and my experience of teaching mindfulness. I cannot imagine living without my daily practice. It sets me up for the day so I am calmer, I respond rather than react to unwelcome situations and I’m a lot more effective. Those I teach experience something similar. When practicing we focus, for example, on the breath. This improves our attention (Jha et al, 2007), which is very useful in itself, and it can also shrink (a good sign) our amygdala (Hölzel et al, 2010), an emotion centre in the brain, so we respond rather than react. Often we add to our suffering by going around and around an event or comment in our heads, and when talking to others. Mindfulness helps us accept what is already here, already present, and enables us to work with it wisely. It is not about not acting, ignoring or pushing away the unpleasant but a way to be with what has already arrived and, if appropriate, do something about it. 3) Is there a particular need for Mindfulness in our Schools? Absolutely. Stress in the teaching profession is already a problem, and it is growing. Many of us have witnessed very committed and talented teachers who have ‘burnt out’ and how stress is not just depleting our teachers but lessening the effects of good teaching practice. I’ve also seen the detrimental effects of more testing, more evaluation and more paper work. This is all aimed at the tip of the problem. If we take the analogy of a tree, it only focuses on the leaves. We need to get down to the roots, which feed the whole tree. Mindfulness gets to the roots of how we think and act, and feeds all who come in connect with the mindfully alive person. Mindfulness is a great way to work with this. The individual, and everyone they come in contact with, benefits as the individual’s attitude and behaviour changes and radiates to others. It can only take one teacher to commit to that learning and practice, and to speak about what they are doing, for school leaders to begin to pay attention to what is causing the change in this individual. I’ve been lucky to observe first-hand the difference mindfulness can make in a school setting. 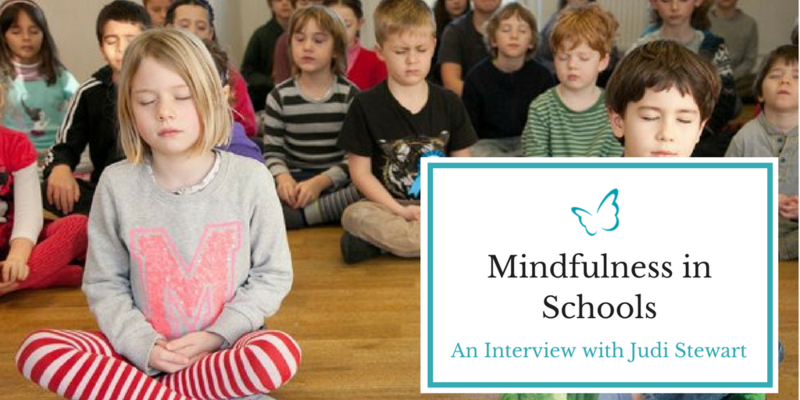 In one class that I know about, mindfulness is now a core part of the way they work and how the leaders, teachers and the children have become calmer and more caring, as a result. The children now ask for a mindful pause when things are not going well. They learnt this from the teacher inserting mindful pauses when the class was distracted. 4) What Research is out there that Mindfulness helps to reduce Stress? A number of pieces of research have been undertaken in this area. The actual effects on the individual have been subject to research and some of this has been specific to stress as experienced by teachers. For example, a Mindfulness Based Stress Reduction course was taught to a group of primary teachers. The results were positive, as there was improvement in anxiety, stress and depression for most participants (Gold et al, 2009). The plethora of mindfulness research is also bringing mindfulness to the attention of the Government through their increased interest in mental health (Thriving at Work, 2017) and the recommendations that came from the report by the Mindfulness All-Party Parliamentary Group (MAPPG). Thriving at Work recommended that best practice is drawn from the three largest public employers, which includes Education, to share with others in the sector. The MAPPG specifically recommend that three schools be selected to pioneer mindfulness teaching and look at how to co-ordinate, develop and create models of replicability and scalability. The MAPPG also recommended that £1million is annually set aside, so schools can apply for funds to implement the teaching of mindfulness. 5) What are the obstacles you can face when trying to develop a mindfulness practice – and how can these be overcome? Time is a big element, as well as feeling too overwhelmed to do anything apart from what we are already doing. This is the vicious circle; as the stress gets worse, we begin to be stressed by our stress!! Like so many other things in life there is learning and practice before the effects of mindfulness speak for themselves. It is the same as making a choice to eat what suits our bodies. When we see how over a period of time that we feel better, we are encouraged to continue. Yes, sometimes we will ‘fall off the wagon,’ so to speak and like healthy eating we usually come back to it when we start to feel the effects of not doing what works for us. 6) What’s a good first step, if you want to build mindfulness into your Leadership practice? When we talk about practice in mindfulness we are referring to meditating. There are many ways to start a personal mindfulness practice and one of the best is to undertake the eight-week MBSR course. This provides basic understanding and learning on how to meditate, which in turn supports living more mindfully. These courses are experiential and there is real benefit from the group learning. The core practices you learn are the body scan, sitting and walking practice as well as yoga type movement. Movement helps us to connect to ourselves and to others, and these practices provide a bridge from the mindfulness practice into our life. 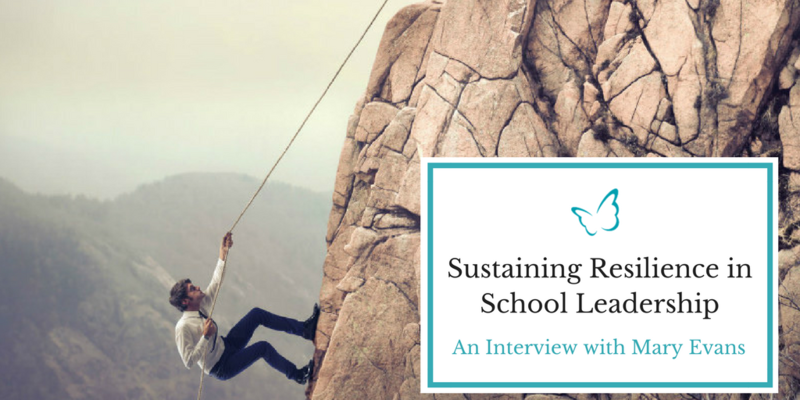 In her expert interview, executive coach, Mary Evans discusses the challenges of school leadership and why it is vital that school leaders sustain and safeguard their resilience, if they are to survive in the profession.